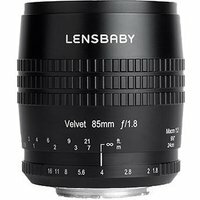 The Lensbaby Velvet 85 is an 85 mm f/1.8 SLR and Mirrorless camera lens with 1:2 macro capabilities. It brings the ethereal glow and crisp vintage look of Lensbaby's popular Velvet 56 lens to photographers looking for a portrait-friendly 85 mm focal length. Velvet 85 builds on the 56s ability to create smooth skin tones with the compression and beautiful bokeh found in high-quality 85 mm lenses.